There are whisky writers who claim that one only needs three ingredients to make whisky: water, malted barley, and yeast. Other people say: it takes four ingredients: also the people who make it. My question to all the above is: Aren’t we forgetting a MAIN ingredient? What ingredient defines for example the colour of a whisky (except for caramel off course), what ingredient gives certain bottlings a ‘touch’ that no other bottling of the same brand can have? I can hear you thinking, and you are thinking correctly: the cask is a MAJOR ingredient in the production of whisky as well. I would even put it like this: the cask can make a good spirit even better, but can also ruin a good spirit. It can turn a lousy spirit better, and can make a lousy spirit a total fiasco. The maniacs have written about the casks before, in E-pistle #12/01 about finishing casks and in E-pistle #12/18 about the different species of oak that are used for the cask, but I wanted to take a closer look at the subject. 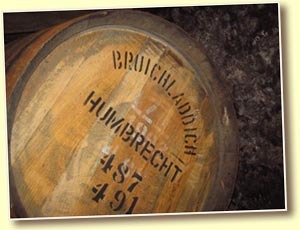 – Oak is a very strong wood, so it makes the cask very strong to be able to ‘rest’ for many years with whisky in it. – Oak is a very ‘pure’ wood, without resin canals that can give strong flavours to the whisky. – There are the oak-lactones, These give good flavours to the whisky. These are the so-called cis- and trans-isomers of 5-butyl-4-methyl-4,5-dihydro-2(3H)-furanone. These are derived from oakwood, and the cis-isomer is an important contributor to wine and/or whisky flavour. For now, I won’t go any deeper in this lactone-story, because we’re talking casks in general now. These lactones will be treated in a next article. – It adds good things (flavours, colour, …): additive. – It takes away bad things (sulphury notes, immatureness): subtractive. – It interacts with the wood by converting good elements from the wood to good elements for the whisky: interactive. How do these elements contribute to the whisky? – Cellulose: Holds the wood together. – Hemi Cellulose: Consists of sugars that to the following when heated (toasted or charred). They give body to the whisky, they give sweeter aromas to whisky, and they give colour. – Lignin: The ‘building blocks’ that give the following things after being heated: vanilla, and sweet, smoky, and spicy flavours. – Oak Tanins: Give complexity and delicacy to the spirit. Without these, the spirit would be ‘boring’. – Lipids & Lactones: Lactones are a derived product from the lipids in the oak. They strongly increase by toasting the cask. They are responsible for the woody, coconut character, and give for example bourbon its typical character. There are higher concentrations of lactones in American oak than in European oak. Most used wood for whisky casks. Has more vanilla and more lactones than European oak. Mostly found in France, so mostly used in wine production. Grows slowly, and has more vanilla than the other European variation. Mostly found in France, but this one is more used in cognac industry. Grows faster and has more tanins than the Sessile. Winemakers are convinced that slowly growing oak has a much better influence on their products. Whiskymakers don’t consider this. If we take a closer look, we see that there are indeed more ‘good elements’ in slow growing wood, especially vanillas and oak lactones. Another CAPITAL element is the drying of the wood. By drying the wood, there are certain chemical compounds of the wood that will be converted to more ‘wanted’ types. Wood for wine casks will dry for 24 months, wood for whisky casks will dry for 6 – 12 months, and sometimes even less… The easy air-drying is better than the quicker and less natural kiln drying: it reduces tannic astringency and releases more vanilla. One other thing we should take a look at, is the heating of the wood before using it for maturing whisky. The heat-treatment before using the cask has an important (maybe even a key-) influence. There are two types of heating, being toasting and charring. Toasting (intensively heating the wood) transforms the tastes the oak can give to the whisky. Depending on the specific toasting technique, vanillas, lactones, toastiness, spice characters and tannins can be more or less provided by the wood itself. Charring means physically ‘burning’ the cask with a flame. Charring takes place after toasting, and is by law to be done for ‘Bourbon’. It does the following to the wood: 1) The char is a kind of filter for sulphuric notes and notes of immaturity from the spirit. 2) Is traditionally done for 40 seconds to 1 minute, but some experiments up to 3-4 minutes are done lately. 3) Creates dramatic changes at surfaces; effectively toasts layers beneath.